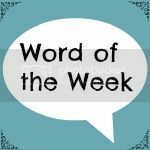 Share the post "Word of the Week 24/6/16"
I went along to Gardeners’ World Live last week and absolutely loved it! I went with my mum, the best gardener I know, which made it all the more special. We very rarely have time to ourselves together these days, as the kids are usually around, so to have a whole day out just the two of us was lovely, and for it to be at something that we both really enjoy made it all the more enjoyable. It gave me plenty of ideas, inspiration, enthusiasm and of course actual plants – yes, I couldn’t come away without buying a fair few, could I?! I shared some of my thoughts in a post earlier this week, 5 Tips for Encouraging Wildlife into your Garden and you’ll probably have spotted a few pics over on Instagram, too. So since then I’ve been gardening, when the weather permits. I’ve moved a few things around, put my new plants in, then requested more new plants courtesy of my mum’s garden (so handy! ), so that’s seen me out there again planting and pottering. When I’m not out there, I’ll often catch myself thinking about it, what I want to move, plant next, buy next and so on. And of course with all of this rain, there’s new growth out there daily to explore and enjoy. My addiction to David Austin roses remains strong (and yes, I totally bought another last Friday), and I have so many of them blooming right now it smells wonderful out there and is all so colourful. So whilst I’ve been busy with various other things this week – playing with the kids, adoring Game of Thrones, reading lots of books, writing plenty of blog posts, getting to grips with my bullet journal – it’s been gardening that has most pervaded my thoughts and where I’ve been spending a lot of time. It was fab, and great to be with there with my gardening guru! That sounds lovely, I do hope the weather does cooperate! It sounds like you had a great time at Gardeners’ World Live and it’s given you plenty of ideas. Ahh! I have got into this series of Game of Thrones. I still have Monday’s episode to watch! That episode is amazing! I am jealous that you have still got it to experience!! I’ve love the beautiful photo’s you put on Instagram of your flowers and it looks like you had a wonderful time at Gardeners Live, I’ve just started to grow flowers in my garden this year and I’m finding it so rewarding watching everything come into bloom. Oh, thank you, I do love sharing my flowers on IG. It is so rewarding, isn’t it? Lovely seeing everything come to life. That wounds like a lovely week 🙂 and I love seeing your photos of your garden on Instagram 😀 Do you fancy sorting my garden out? LOL!! Ha ha, I’ve my hands full here, thanks! Oh you put me to shame with your gardening efforts, our garden looks like its been overtaken by the wilds of the forest!! Glad you had a great time at Gardener’s World Live & it is lovely that you got some quality time with your Mum too.Days out like this are special. Funny, I think my mum is the best gardener in the world, too! How lovely! Sounds like you had a great day with your mum. I wish I could get inspired by gardening. Whilst I love to look at our garden and adore being outside in the sunshine, I just cannot abide gardening! I was just the same until a couple of years ago and now I love it! It is lovely spending time in the garden gardening, though I am not very good at it. Wish I had more time to spare out there. I bet Gardeners world live was great. It was brilliant, made me want to spend hours and hours and ridiculous amounts of money out there – all things that I do not have! !